Dog Eared Publicity is pleased to bring you Mira Peck's MY MEN TOO Book Tour January 16 – February 20! It is 1973 as a plane soars into the clouds above Amsterdam and heads for New York City. Aboard are Alina Sherwin and her American husband, Wayne. Alina's aspiration is nothing less than happiness, but her enthusiasm is marred by the fear of another career failure. Her worries are justified. Alina, the first female chemical engineer in Australia, has yet to find employment in her profession. Thankfully it does not take long before America feels like home to Alina. As she is finally propelled into the executive ranks by supportive colleagues, she uses her influence to elevate skilled workers who do not fit the standard profile. But when her modernization efforts place her in the path of powerful enemies, she must fight to preserve her legacy. Meanwhile, her husband's insistence on an open marriage compels her to leave him, and they both attempt to build new lives. Their love is still very much alive, but is it powerful enough to bring them back together? My Men Too continues the international adventures of an intrepid woman in her quest for personal fulfillment and a more just society. 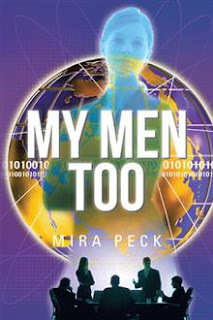 Like Alina, her protagonist in My Men, Mira Peck grew up in Poland and Australia and built a career in the United States. She has degrees in chemical engineering, business, and law. She has received the annual Goldfinch prize twice for her writing (prose, 2013; poetry, 2011), and recognition from the San Francisco 2012 Book Festival for Sour Cherry Tree, a multi-genre collection. In 1997, she was granted the Tribute to Women in Industry award. Her work has appeared in numerous publications including the Goldfinch, Contrappasso (based in Sydney, Australia), and The Journal of Contemporary Issues in Finance and Accounting. She and her husband have two grown children.